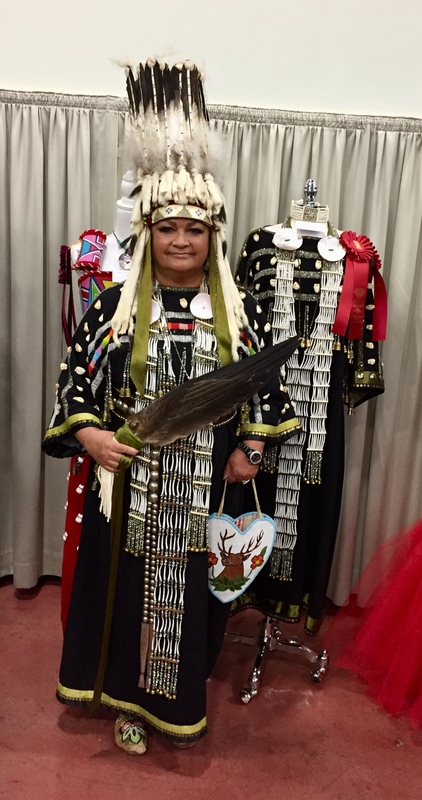 Catherine modeled one of her traditional fashion pieces, which would typically be worn while dancing at a powwow, participating in a ceremony, or other old-style gathering. This traditional dress is inspired by Blackfeet fashion trends dating from the late Nineteenth Century. Catherine wore this dress in an effort to remind all that our traditional fashions are living art, not meant solely meant for museums or display alone. The dress is made of fine Italian wool. On the hem and sleeves are brass sequins, each of which are hand-sewn on. Also on the hem and sleeves is antique silk ribbon. From the sleeves and bust on the front of the dress and back are eighty (80) brass thimbles that hang from strands of cut crystal beads. The beadwork on the front and back reflects a traditional Blackfeet design, dating from the late Nineteenth Century. The dress has 76 real bull ivory elk teeth hand sewn to the front and back. This is notable because each bull elk only has two of these teeth. Historically, women from plains tribes would prominently display these bull elk teeth on their traditional dresses to show what a good provider their male relatives were. It was a traditional sign of status. Catherine also modeled her hand-made dentallium shell hair ties and breastplate. Traditionally, like the wearing of bull elk teeth, women from plains tribes incorporated dentallium shells into their traditional fashions as a showing of wealth and status. 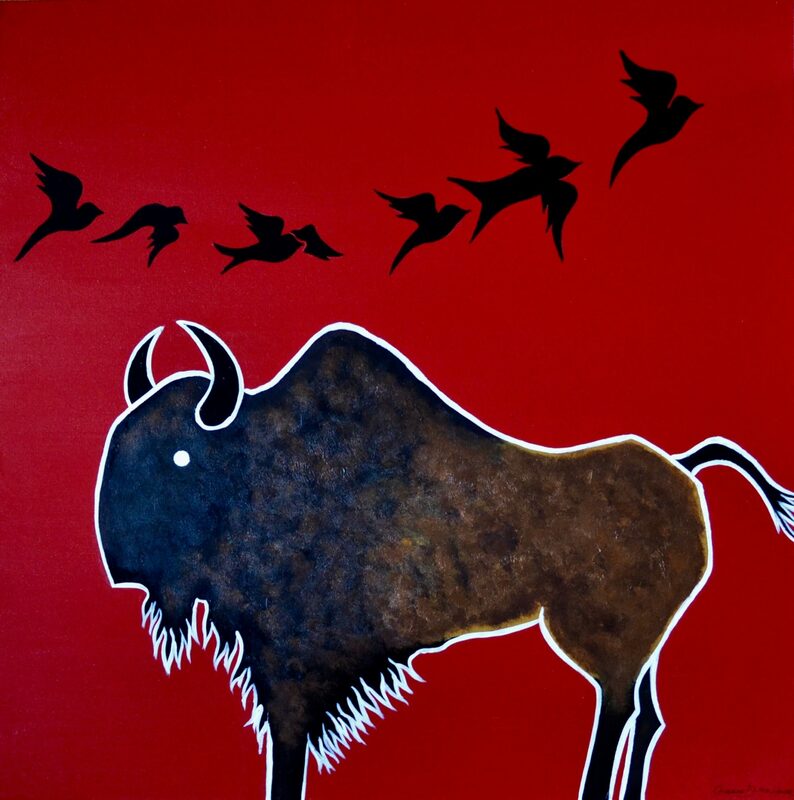 Catherine also wore her Blackfeet Stand-Up War Bonnet, which was transferred to her by the former leader of the Blackfeet Horn Society, Bruce Wolf Child.